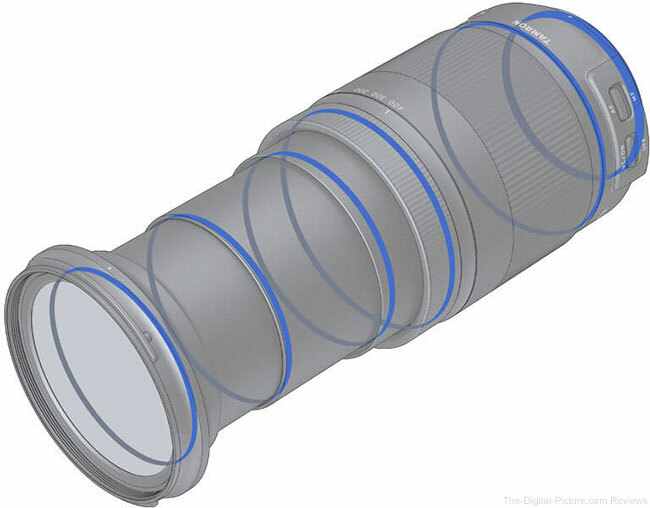 If manufacturing, design and economic constraints were not issues, the perfect lens would cover a huge range of focal lengths, from wide angle to long telephoto and a very wide, constant maximum aperture would be always available. That lens would focus fast and consistently accurately, would feature top notch weather-sealed build quality, would deliver amazing image quality, would have a lightweight, compact design and would carry a very reasonable price tag. As you might have guessed, the perfect lens still does not exist. However, this lens checks off many items in the "perfect lens" wish list, including an extremely-useful, DSLR-record-setting, 22.2x long focal length range, a very compact and lightweight design and the reasonable price tag is there. Is this the first superzoom to break the image quality barrier? That is the primary question I wanted to answer in this review. 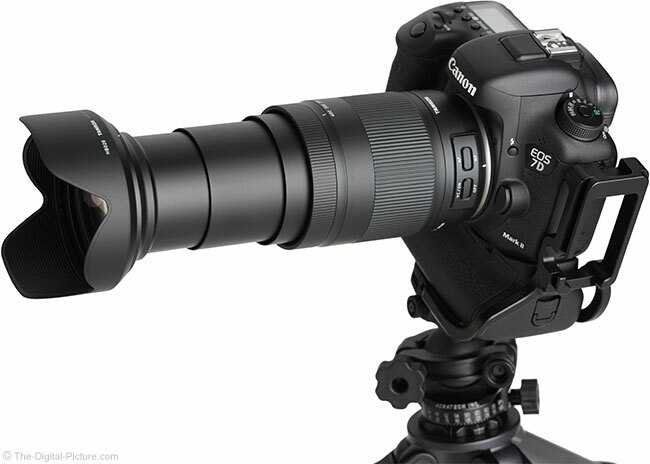 Tamron calls it an ultra-telephoto all-in-one zoom lens. Focal length matters greatly and it should be a primary consideration for your lens selection. 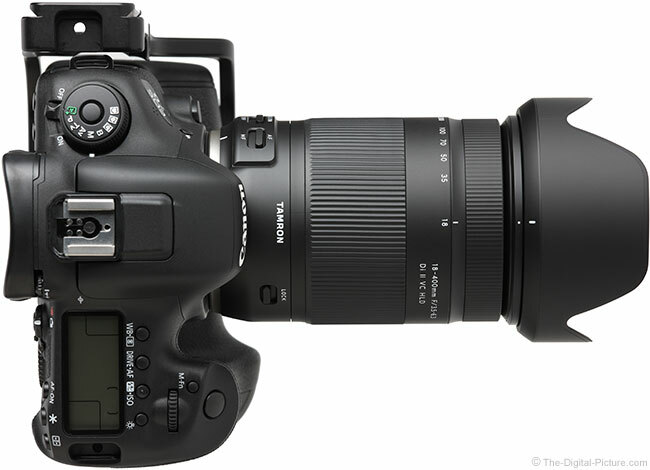 Inarguable is that the 18-400mm focal length range is completely awesome and that is the Tamron 18-400mm f/3.5-6.3 Di II VC HLD Lens' major strength. 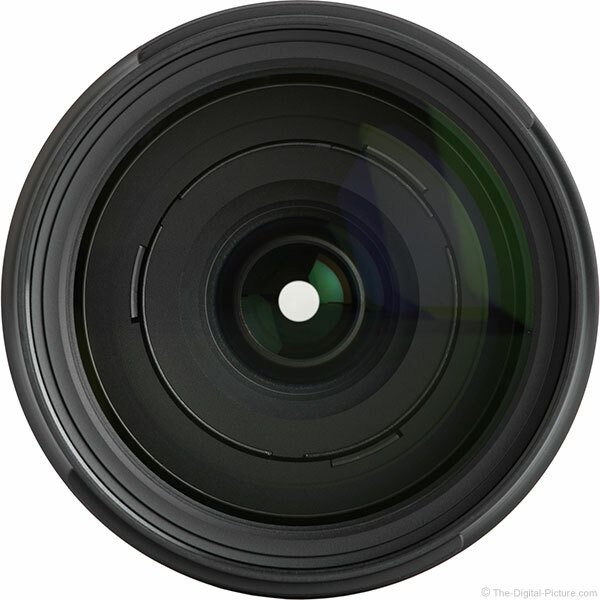 Keep in mind that this is an APS-C-only lens (the "Di II" portion of the name indicates this) as the image circle it projects is not wide enough to cover full frame imaging sensors. Thus, the angle of view presented by this lens on an APS-C/1.6x camera approximates a 28.8-640mm zoom lens on a full frame model. A very significant percentage of photography needs can be met by the focal lengths in this single lens and it is far easier to list the needs not met than to attempt to list the met needs. Those needs not met by this focal length range are primarily those requiring ultra-wide angle focal lengths. A wider-than-18mm (28.8 full frame AOV) focal length will often be utilized by landscape/cityscape photographers and also by those photographing interiors. Primarily needing angles of view longer than 400mm (640mm full frame AOV) are some wildlife and sports photographers. Still, this lens can be used for those same purposes along with a huge additional list. 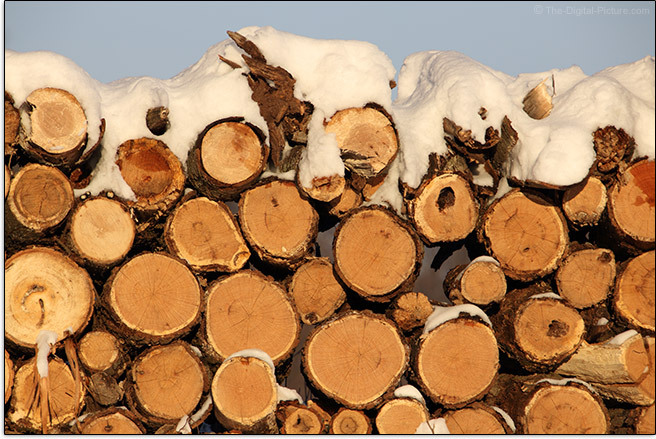 At 18mm, you see a log pile. 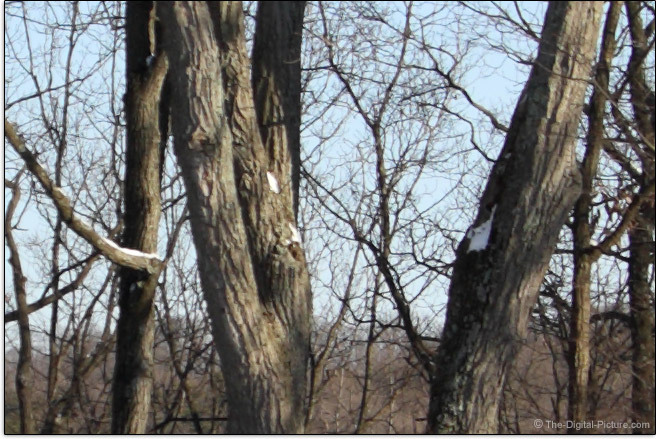 At 400mm, you can count the rings in a log. 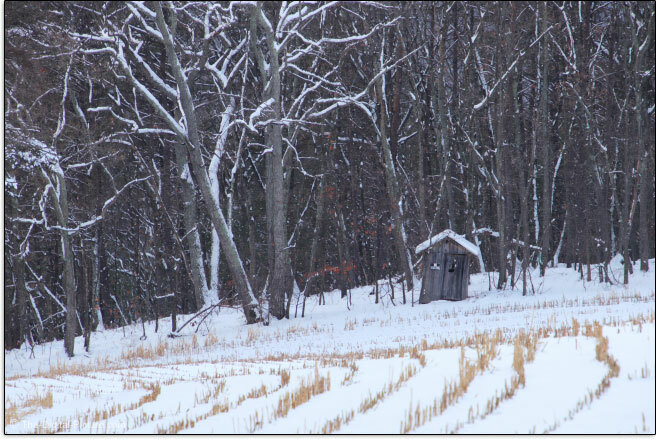 At 18mm, the little shack is just a tiny element in the image. At 400mm, it is the main subject. As many of you know, I try to exercise regularly and trail running is the most frequent exercise I get. Trail running was being hampered by 7" of powder snow, temperatures in the teens (F) and wind chills being driven far lower, but ... it was such a beautiful day and I needed to exercise the 18-400 as well. So, I went regardless of the conditions. While trail running in hiking boots is a slow and arduous process, I quickly forgot about the challenges and took in the beauty of the 18-400mm focal length range. There seemed to be subjects everywhere. If the scene was not conducive to a wide angle view, longer focal lengths could be utilized until something interesting became isolated in the frame. That snow covers over a significant amount of distractions in the frame didn't hurt anything either. 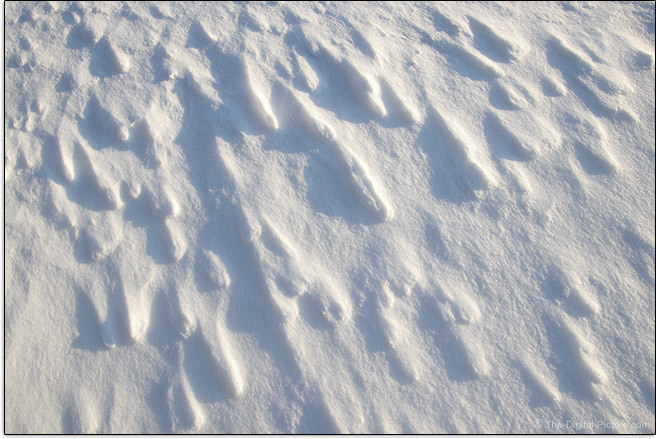 Early on the jog/hike, wind-created patterns in the snow caught my attention and 20mm is what I chose to capture the image below. With sweet light from a setting sun hitting a ridge-top log pile, I took some photos as seen above along with a 200mm f/8 image seen below. 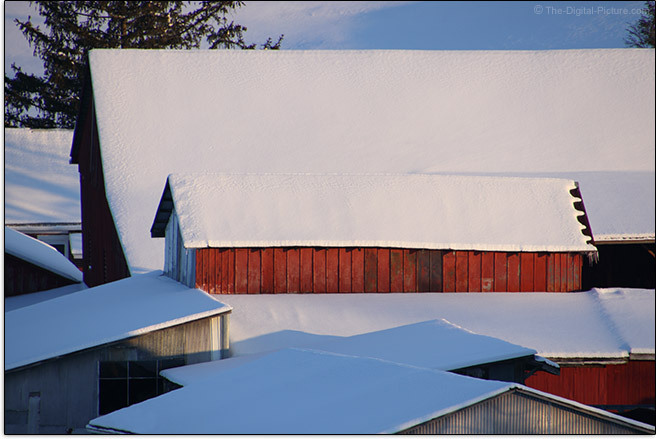 Zoom all the way to 400mm and the top of distant farm buildings become compressed into lines and colors. 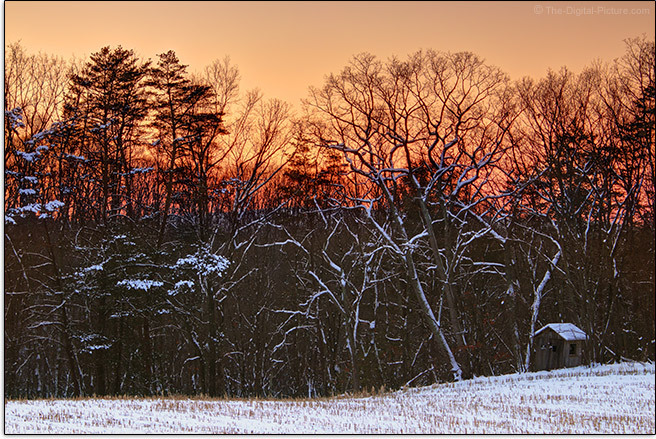 I stopped to capture the fireball setting behind a winter woods setting. Zooming to 27mm gave me the perspective I wanted while keeping the edges of the bottom of the frame uninterrupted. After capturing the focal length range sequence that included the little shack at the edge of a field, the clear sky was turning orange in the west. So, I reoriented the camera position and, aided by a Really Right Stuff TQC-14 Carbon Fiber Tripod, captured an exposure-bracketed set of 70mm, f/8 images used to create this HDR image. I am continuously using a wide variety of camera gear, but the focal length range found in this lens is still impressive to me. The number of uses I found on my nearly-3 mi (4.8 km) adventure through routine environment was quite big. When focal length ranges reach new milestones, a question naturally enters my mind. Does this lens truly reach the complete range in its given name and primarily, is the full 400mm focal length available? Or, was some rounding done? In our image quality test, a target is precisely framed at each tested focal length and the sensor plane-to-chart laser measurement is recorded. While there can be some variation in this measurement due to focus breathing (focal lengths are measured at infinity), distortion and potentially slight imprecision of focal length selection, the 400mm test for both the Tarmron 18-400mm VC Lens and the Canon EF 100-400mm f/4.5-5.6L IS II USM Lens were completed at their longest focal lengths. Thus, both lenses exhibit rather similar pincushion distortion and both were set to as close to 400mm as possible. What do the numbers tell us in this case? The 18-400's 400mm test target (the chart used measures 600mm x 400mm) framing distance was 26.96' (8.218m) while the 100-400's same 400mm setting required 33.78' (10.296m). I'm not going to declare this comparison scientific and focal length is perhaps best measured at even longer distances, but that the Tamron's distance was only 80% that of the Canon's raises suspicion for me. Using these two referenced lenses side-by-side focused at about 92' (28 m), it seems that the Tamron is still not reaching a true 400mm at this distance with perhaps 360mm being a rough estimate of what I see. Regardless of the exact focal lengths, I can tell you that there is no question that this lens' focal length range is huge. The 18mm setting provides a mid-wide angle of view and the 400mm focal length setting has a very narrow angle of view that brings your subjects in very close. It is really nice. And, I'd rather not have the exact measurement lens naming complication to deal with – an 18.3-381mm lens, for example. A perfect lens wish list box the Tamron 18-400 leaves unchecked is the wide aperture one. This is a relatively dark lens. Because aperture is measured as a ratio of lens opening to focal length and because this lens' maximum opening does not increase enough with focal length increase to maintain the same ratio, the max aperture is a variable one, ranging from f/3.5 to f/6.3 as the focal length range is traversed. The advantages of a narrow aperture, because the size of the lens elements can be reduced significantly, include lighter weight and lower cost. Those are two things that we all can appreciate. The variable max aperture has the same two advantages, compounding the benefit. A downside to the variable max aperture is that, by definition, the same max aperture cannot be used over the entire focal length selected. Your camera will automatically account for the change in auto exposure modes, but making use of the widest-available aperture in manual exposure mode is complicated somewhat. The bottom line is that this lens has a relatively narrow aperture at the widest focal length and well before 400mm, it has the narrowest max aperture found with any frequency in any modern lens. In fact, it is 1/3 stop narrower than many cameras require for autofocus to function (f/5.6). Apparently there is some leniency in this spec as, fortunately, these cameras will autofocus this lens. Here is the max aperture breakdown as seen by a Canon EOS camera with 1/3 stop aperture settings enabled (the default). 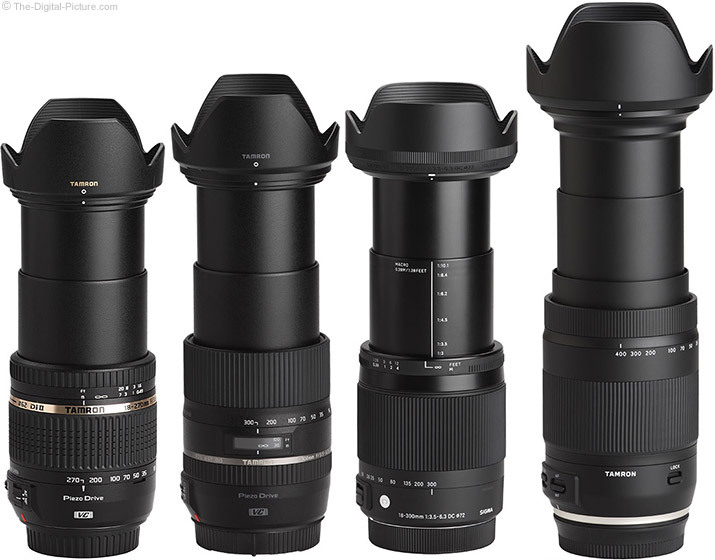 If your lens is missing from this list, head over to the full Tamron 18-400mm f/3.5-6.3 Di II VC HLD Lens specs using the site's Lens Spec Comparison Tool that enables far more comparisons. This is not an ideal lens for stopping low light action. When the sun goes down, action sports photographers using this lens (or similar models) will be reaching for very high ISO settings to keep images bright enough with the short shutter speeds needed to freeze their subjects' motion. This lens is not a good choice for indoor sports, but can certainly be sufficient for covering outdoors sports with ample daylight. While wider apertures are better for creating a background blur, long focal lengths also have this ability and using those, this lens can create a very strong background blur. Position your subject close to the lens with a distant background, zoom to 400mm and watch the background melt away. Above is an example of the near-maximum background blur this lens can produce. The background object is unrecognizable. Do the same at 18mm and, with the background being far less magnified, you would easily recognize this as a pine tree. Telephoto focal lengths magnify camera shake and faster shutter speeds are one way to retain sharp images at such. Without wide apertures helping to make fast shutter speeds available, this lens is disadvantaged from the start. That is where Vibration Compensation (VC) saves the day, adding significantly to the versatility of this lens and potentially greatly improving image quality. 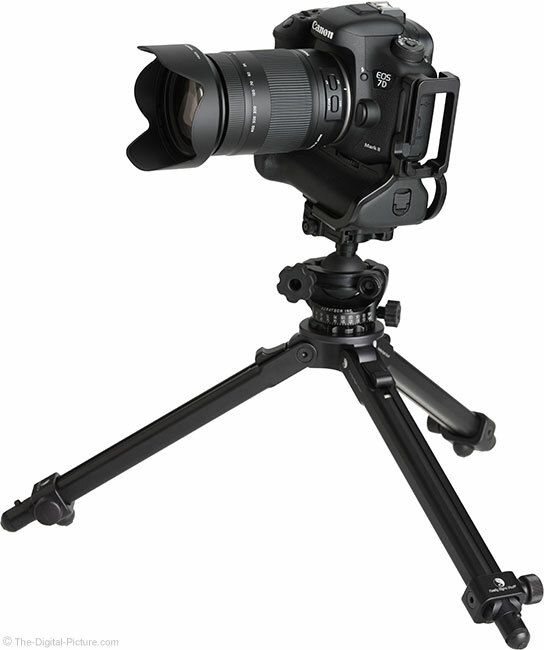 When you need to leave the tripod behind, VC is there for you. Tamron rates the 18-400's VC system at only 2.5 stops of assistance. This is the lowest image stabilization rating I recall seeing in a very long time and it falls well behind the at least approx. 4-stops of assistance typically included in the stabilized lenses introduced over the past few years. That said, 2.5 stops is still quite helpful. While VC is great for reducing camera shake in images, it is also very helpful for framing subjects while taking photos. Handholding this light lens fully extended at 400mm and critically framing a subject with the resulting narrow angle of view is somewhat challenging. That challenge is reduced by VC, though only a really steady photographer will see a completely still handheld image in the viewfinder at 400mm. Slight framing movements result in a slight jumping of the scene in the viewfinder as VC re-adjusts to the new position. Because of its relatively narrow max aperture range and relatively low rated VC implementation, low-light photography is not high on this lens' list of strengths. However, when photographing still subjects in moderately bright conditions, the stabilizing benefits of VC will be appreciated. When using a circular polarizer filter with narrow apertures (typical for landscapes and cityscapes), VC can be helpful even under a full sun. Another image stabilization benefit that should not be overlooked is the aid in AF precision. 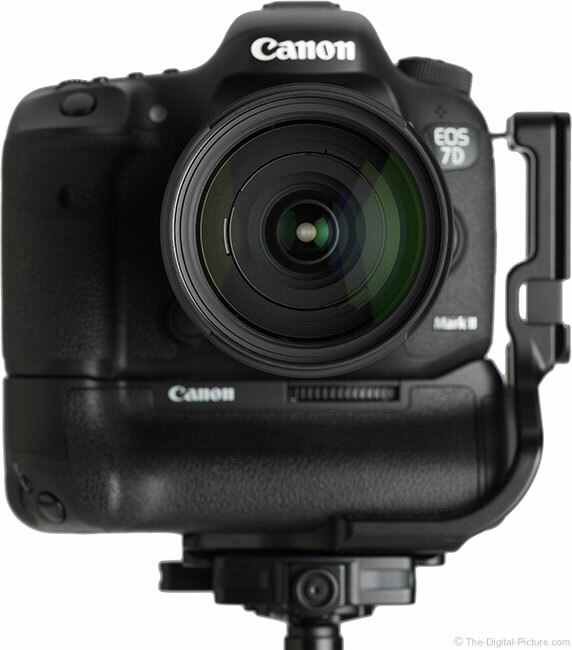 The camera's AF system can produce better focus precision if the image it sees is stabilized. AF precision is not necessarily challenged with the depth of field(s) realized by using this lens, but anything that benefits AF accuracy can certainly be appreciated. VC is also very useful for video recording, making a big difference in the steadiness of handheld-captured videos. This VC implementation is very quiet with a light clicking being audible on startup and shutdown and with only a very faint hum heard while activated. VC activation sometimes causes the viewfinder image to jump and the scene drifts in the viewfinder somewhat, especially at 400mm, and the movement is very apparent when a tripod is being used. Tamron notes in the lens users' manual that VC may not perform correctly during tripod use and that it should be turned off for long exposures captured in Bulb mode. If using a tripod, I suggest leaving VC disabled. Overall, VC makes a noticeable difference in the stability of the image in the viewfinder and even 2.5 stops of added handholding capability represents a big advantage over a non-stabilized lens. I am always skeptical when image quality testing a superzoom lens as excellent image quality has never been a reason to choose a superzoom lens and I didn't list great image quality as one of the perfect lens wish list boxes being checked off by this lens. At 18mm with a wide open f/3.5 aperture, the Tamron 18-400 is reasonably sharp in the center of the frame, soft in the mid-frame and very soft in the corners. The stopped down image quality description is not that much better than the wide open description, but it is somewhat improved. Stopped down to f/5.6, the center and mid-frame sharpens slightly and stronger improvement is seen in the corners with only a very slight additional improvement seen in the corners at f/8. In the focal lengths we tested, 18mm image quality is as good as it gets. By 50mm, image quality is very noticeably worse, especially in the center and mid-frame areas. 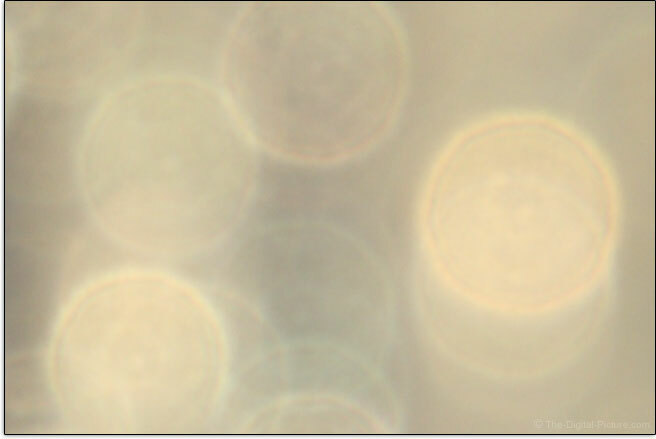 The image quality change from 50mm to 100mm is not significant, but further degradation is obvious by 200mm. I'll call 300mm and 400mm results equally as bad as the 200mm results. Sorry, stopping down to f/8 is only going to produce very minor improvement at any of these focal lengths and, especially at narrower aperture settings, diffraction is already negatively affecting sharpness with current model DSLRs and MILCs in use. While comparing a lens with one that costs nearly 9x as much is not completely fair, it does reveal what is missing in terms of resolution and contrast. With both lenses set to their sweet spot apertures, the difference between what image quality is and what it could be is stark. Again, that is an extreme comparison, but the difference should be understood. 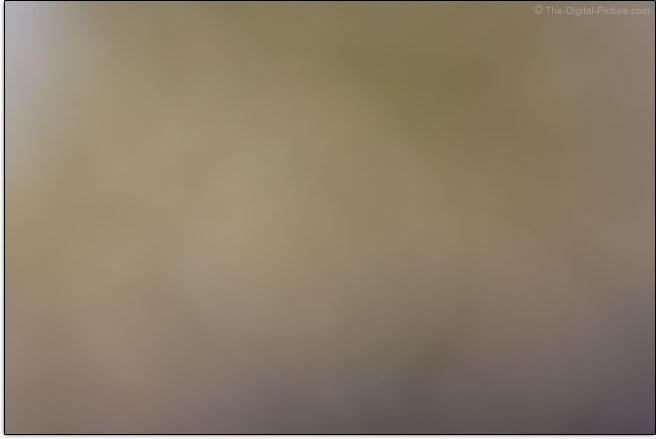 Let's look at some outdoor, center-of-the-frame, 100% crop images. These images were captured in RAW format using a Canon EOS 80D and processed in DPP using the Standard Picture Style with sharpness set to "2". OK, so that wasn't so encouraging. What about vignetting? Essentially, all lenses used on cameras taking full advantage of the provided image circle have this and this report is definitely more encouraging than the last. 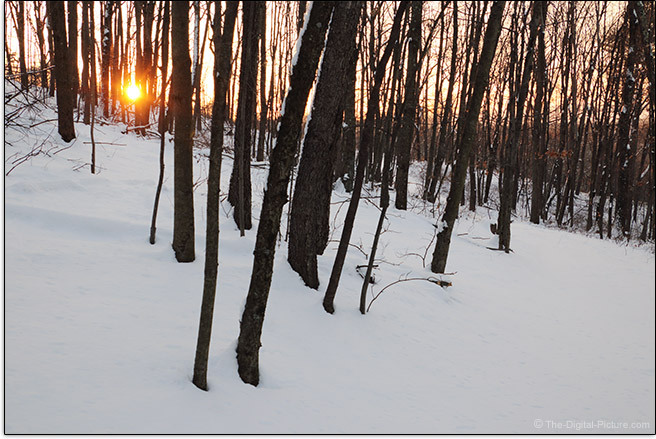 Expect a moderately-noticeable about-2.5 stops of peripheral shading in the corners at 18mm f/3.5. Vignetting steadily decreases as you walk the aperture down until f/8 where the corners remain darkened by a barely noticeable .8 stop. Increase the focal length to 50mm and a seldom-noticeable approximately .5 stop of vignetting remains at the f/5 max aperture. At focal lengths longer than 50mm, vignetting increases slightly to a little more half a stop wide open through the end of the focal length range. Still, corner shading is unlikely to be noticed under most typical shooting conditions. The effect of different colors of the spectrum being magnified differently is referred to as lateral (or transverse) CA (Chromatic Aberration). Lateral CA shows as color fringing along lines of strong contrast running tangential (meridional, right angles to radii) with the mid and especially the periphery of the image circle showing the greatest amount as this is where the greatest difference in the magnification of wavelengths exists. The Tamron 18-400 shows a moderate amount of lateral CA in the 18mm corners. By 50mm, the lateral CA colors change, but the amount does not. The amount of color spread increases to very strong through 300mm and remains so through 400mm. The Tamron 18-400 shows an intermediate amount of flare with the longer focal lengths and narrower apertures producing the most of these effects. As is typical for a zoom lens, this lens has barrel distortion at the wide end that transitions into negligible distortion and on into pincushion distortion at the long end. The 18-400 VC shows moderately strong barrel distortion at 18mm and quickly moves to minimum distortion at a slightly longer focal length (approximately 20mm). Moderately-strong pincushion distortion remains present over the balance of the focal length range. Bokeh is one of the hardest image quality aspects to evaluate, but I like what I am seeing from this lens. Above is a 50%-reduced crop showing the background blur at 70mm f/11. 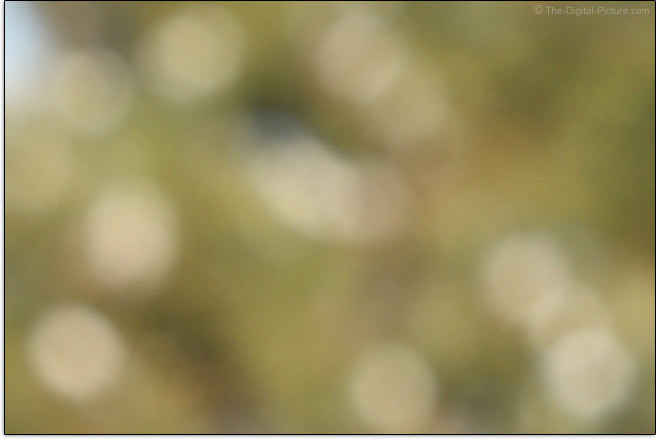 Below is a 100mm f/8-captured example showing out-of-focus specular highlights. The quality of these highlights appears nice and, aided by the fact that f/8 is not very much-stopped-down, they are quite round in shape. The shape of the 7 aperture blades closing down shows modestly more at f/11. The 7-blade count, being an odd number (vs. even, not as in abnormal), is responsible for creating sunstars showing 2x as many points, 14 in this case. 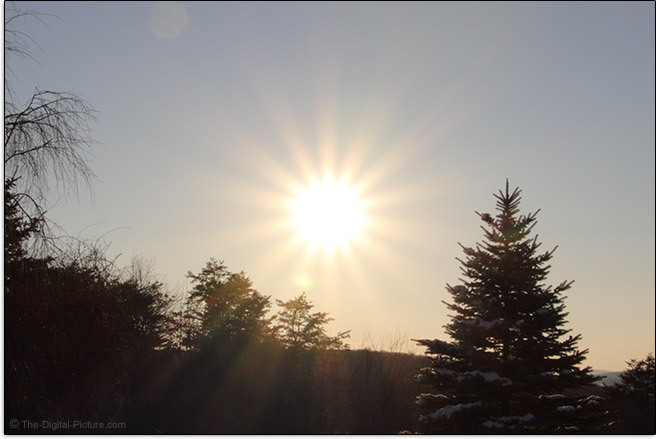 Note that this lens is not a great choice for creating huge sunstars. Lenses with wide apertures are usually advantaged in that regard. While some of the Tamron 18-400's image quality attributes are decent, this is still not the lens those seeking image quality perfection will want mounted on their camera. Perfect image quality is not what this lens is all about. While I wouldn't define this lens' AF system audibility as loud, expect to hear shuffling, clicking, "grrr"ing and even clunking at times. Focus speed in good light is quick. Focus accuracy is generally the primary concern for an AF system and in that regard, my experience has not been good. I used a Canon EOS 80D for testing and even with the substantial depth of field provided by the narrow max-apertures, the results have been inconsistent. This retail-obtained review lens performed especially poorly at 18mm, with results ranging from correctly-focused to extremely back-focused. The longer focal lengths performed better, but still were only OK overall. I know, you're thinking that this lens has the best image quality at the wide focal lengths but focuses least-accurately at the same and that an out-of-focus subject never has good image quality. And you would be correct on all points. When I was a kid, I had to find a hill if I wanted to go sledding. I'm always watching for interesting subjects for lens testing and a fresh powder snow availed this one. Many years ago, we bought the kids each a sled for Christmas. I was tired of sleds constantly breaking (a potential safety hazard) and decided to buy what appeared to be a good quality model (priced as such) from a high-quality-only retailer. While the sleds were as nice as I imagined, they had one serious flaw: they were not slippery in the snow and didn't slide very well. Since sliding is the primary purpose of a sled, I figured that I had wasted the money and my quest was not solved. 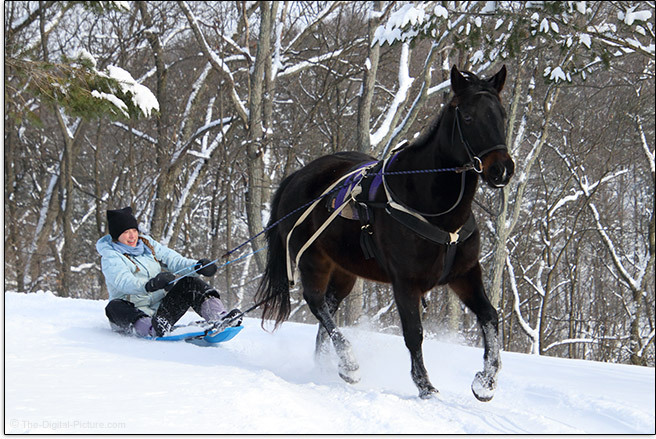 Fast forward to a few years later and the girls figured out how to attach the sleds to the horses and ... these sleds worked perfectly. The horse trotting around was not the easiest subject for a camera and lens to track in AI Servo mode, but again, the narrow max aperture does not stress the AF system and I was using f/8 for the best image quality I could get along with some extra depth of field. In this scenario, this lens performed reasonably well. Note that subjects photographed with this lens change in size by a considerable amount during focus adjustment. While this attribute is not unusual, photographers intending to use focus stacking techniques involving focus distance adjustment, videographers pulling focus and anyone very-critically framing a scene should be aware of this. Focus distance transitions when using this lens with Canon's excellent Dual Pixel AF in Video Servo mode are smooth. The Tamron 18-400's manual focus ring is not of big importance to a large percentage of those who will choose this lens. But, it is still worth taking a look at. This focus ring is positioned toward the front of the lens as I prefer and the ring's size is, at least relative to the lens size, modest, yet quite adequate. Though very smooth, this focus ring is nearly undamped. That aspect combined with the very short 53° full extents rotation means that precise manual focusing, especially at the 400mm end, is challenging. The minimum and infinity stops are fixed and focus settings are repeatable by ring position, though the distances are not marked and marks would need to be precisely hit for successful use of that aspect. The Tamron 18-400 VC further qualifies itself as an all-in-one zoom with a maximum magnification (MM) rating of 0.34x, a best-in-class spec, at its minimum focus distance (MFD) of 17.7" (45 cm). While this lens may not cover all of one's macro needs, it will certainly perform better at the task than most of its peers. At 400mm focused to the minimum focus distance, figure just under 2.5" (64mm) of subject fitting horizontally into the frame. 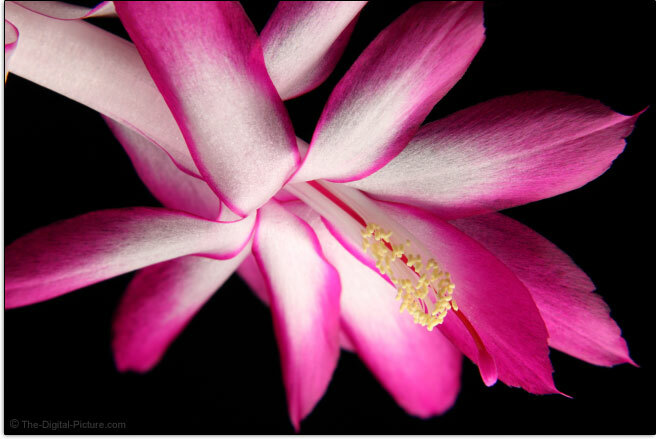 This Christmas cactus volunteered to illustrate this capability by blooming exactly when I needed a small, attractive subject. To reduce the MFD and thereby increase the MM, mount an extension tube behind this lens. Since extension tubes make the most difference at wider focal lengths and this lens' maximum magnification occurs at a very long focal length, extension tubes will not provide a significantly-increased improvement at longer focal lengths. Focus breathing can mean that a lens behaves as a shorter focal length at minimum focus distance and that means that extension tubes will show a bigger benefit. Note that infinity and long distance focusing are sacrificed with an ET in use. The Tamron 18-400mm f/3.5-6.3 Di II VC Lens, with a matte black finish, modern white lettering and a smooth shape, looks great and bears resemblance to its most recently-introduced siblings, including the Tamron 24-70mm f/2.8 VC G2 lens and the Tamron 70-200mm f/2.8 VC G2 lens. The smooth shape of this lens makes it feel similarly-nice in hand. 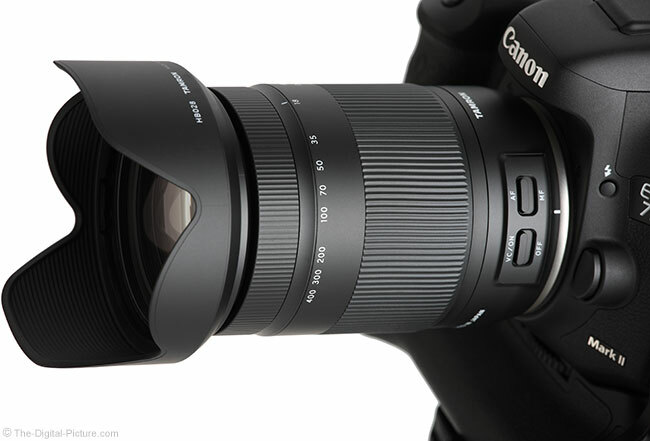 The zoom ring, what will easily be the most-used feature on this lens, is ideally-positioned, is mostly ribbed-rubber-coated and is significantly-sized, consuming most of the lens barrel. Twist it to 400mm and the length of this lens increases by a huge 3.54" (89.8mm), practically doubling the length. While that extension amount is not unexpected, it is a large amount nonetheless. Considering that 3 barrel sections are extending, the zoom ring is relatively smooth. Especially when extended, this lens has some flex, seen even behind the zoom ring. Only a small gap lies between the zoom ring and the significantly smaller focus ring, but a small diameter change makes it easy to distinguish between them by feel. Both zoom and focus rings rotate in the Nikon-standard direction (opposite of the Canon standard). The AF/MF and VC On/Off switches are nicely-positioned, ideally-shaped and provide a firm click as they move into position. A lock switch is provided to hold the lens at the fully retracted position (only), though gravity-induced extension was not an issue with the new lens I used. 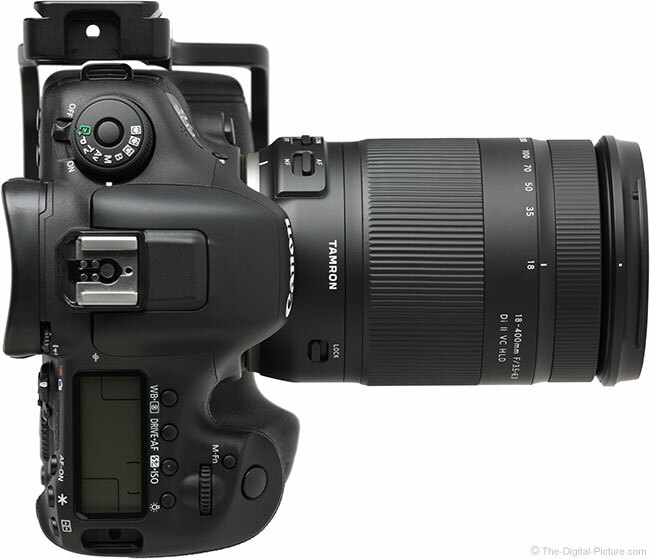 The Tamron 18-400 has a weight approaching the heaviest in its class. However, no other lens in its class has that last 100mm of focal length range. Remarkable is that the Tamron 18-400 weighs only slightly more than 60% of the lightest other lens that provides the 400mm focal length. That happens to be another Tamron lens. Pick up a lightweight lens and it is not going to provide that satisfying heft that exudes high quality, such as that provided by an all-metal, wide aperture Zeiss lens. But, light weight has valuable aspects and a primary one is that you don't get tired of carrying the lens as quickly. A carried lens holds far more potential for image capture than one left behind and this lens is especially lightweight relative to that of two non-all-in-one lenses required to cover the same focal length range. Another benefit of light weight construction is often the construction cost. 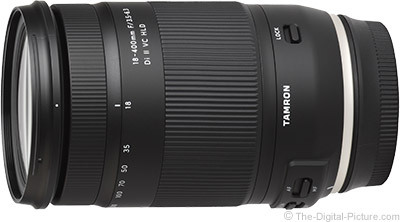 The Tamron 18-400's engineering plastic exterior barrel construction is a common choice for today's lenses. 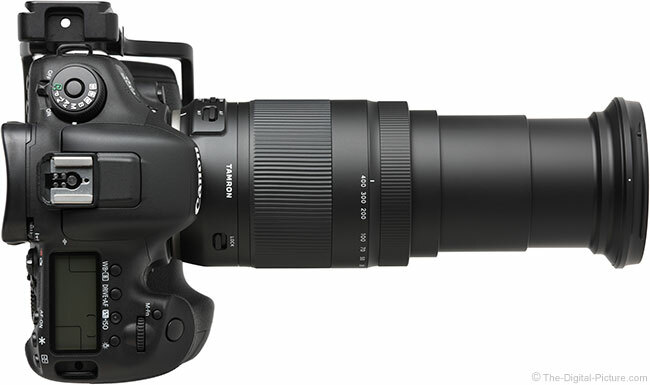 The Tamron 18-400mm f/3.5-6.3 Di II VC Lens is somewhat-large for an APS-C format lens and it is the largest lens in its class, though not by a huge margin. The margin between the 18-400 and the next larger 400mm lens, with the Sigma 100-400 edging out the Tamron 100-400 in that regard, is huge. For many more comparisons, review the complete Tamron 18-400mm f/3.5-6.3 Di II VC HLD Lens Specifications using the site's Lens Spec tool. Note that, especially at longer focal lengths, there might be a bit of sag noticed after tightening a tripod head, even when using quality models. This lens can produce enough torque to the setup for this to occur. Photographers tend to be visual and I always find a picture making the differences easier to understand. The same lenses are shown below extended to their longest focal length with their hoods in place. 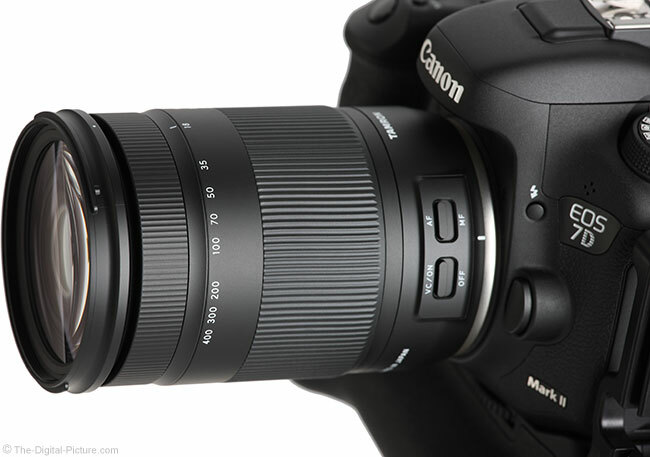 Use the site's product image comparison tool to visually compare the Tamron 18-400mm f/3.5-6.3 Di II VC HLD Lens to other lenses. 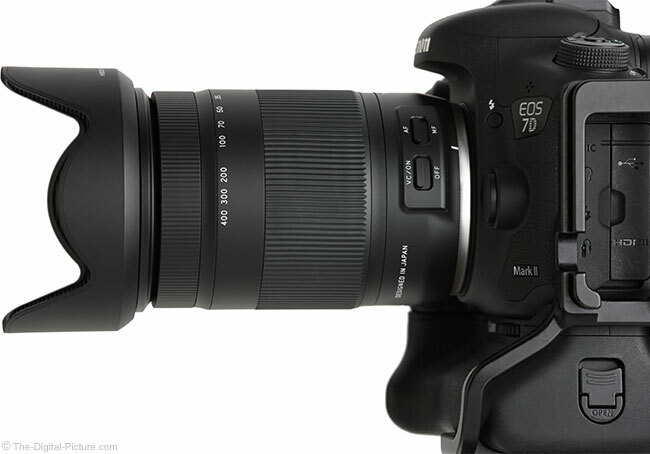 I initialized that link to include the Sigma 100-400mm f/5-6.3 DG OS HSM C Lens in comparison (the Tamron 100-400mm f/4.5-6.3 Di VC USD Lens images are coming soon). The Tamron 18-400 VC uses 72mm filters that are modest in size and relatively common. 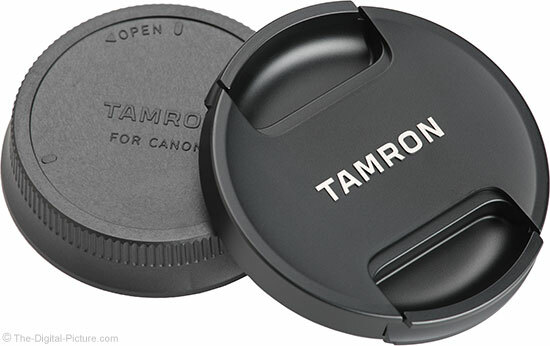 Great is that Tamron includes a lens hood with all of their lenses. This hood is modest in size, though it provides a good amount of protection to the lens from both impact and flare-inducing light, especially at the wide end of the range. The hood is constructed of strong molded plastic and demonstrates a small amount of flex (good for absorbing impact). With the hood mounted in reverse position, it does not significantly increase the width of the lens, making it easier to pack. No lens case is included in the box, but finding somewhere to stow this lens should not be challenging. Lowepro's Lens Cases are a very nice and affordable solution for single lens storage, transport and carry. 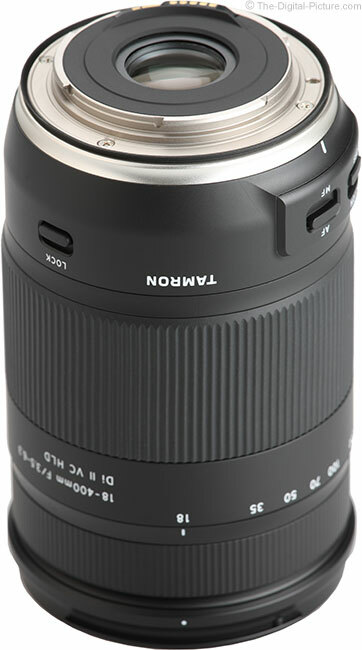 The Tamron 18-400mm f/3.5-6.3 Di II VC HLD Lens is compatible with the Tamron TAP-in Console. I tried attaching the lens to the Tap-In Console, but the software did not recognize it and that of course led me to believe that the 18-400 was not a supported model. A friend of the site informed us that he was able to connect his 18-400 to the Tap-In Console and Tamron support verified that it should work, advising us to re-install the software. Once the lens is attached to the console and the console attached to the computer, the TAP-in Utility software app communicates with the lens and then checks for any available firmware updates. If an update is available, a dialog box is presented, providing the option to update the lens. There have been a number of Tamron lens firmware updates released recently, addressing compatibility and other issues. Having the TAP-in Console makes those updates very fast and easy, especially compared to the alternative of shipping a lens to a service center. Within the TAP-in Utility app, most will find the first tab, Focus Adjustment, to be the most important. Autofocus adjustments can be made at multiple focal lengths with multiple focus distance adjustments available at each focal length for a large number of total adjustments available. The Tamron 18-400 VC Lens is priced higher than most other super-zoom all-in-one lenses with the Nikon 18-300 DX being much more expensive. The 18-400's price is modestly higher than some and significantly-higher than others. But, record-setting lenses seldom have a directly-comparable alternative (until the record is minimally equaled) and in this case, none of those other lenses reach beyond 300mm. Record-setting features are nearly always worth a higher price. Whether or not you think this lens is a good value will likely depend on the grade of image quality you expect/require because this lens' focal length range is simply awesome. The Tamron 18-400mm f/3.5-6.3 Di II VC HLD Lens is available in Canon and Nikon mounts. My standard disclaimer: There are potential issues with third party lenses. Since Tamron reverse engineers (vs. licenses) manufacturer electronics and algorithms, there is always the possibility that a DSLR body might not support a (likely older) third party lens. Usually a lens can be made compatible by the manufacturer via a firmware update, but this cannot be guaranteed. Tamron USA provides a 6-year limited warranty (Tamron's international limited warranty is 1 year). The evaluation lens was obtained online/retail. While there are a host of 16mm or 18mm-to-something super-zoom all-in-one lenses on the market, as of review time, none of those extend beyond 300mm and some, including the Canon EF-S 18-200mm f/3.5-5.6 IS Lens, stop at 200mm. None of these deliver stellar image quality and aside from the focal length range differences, selecting between the models is a big challenge. In many cases, there is no clear winner. As mentioned earlier in the review, weather sealing is a Tamron 18-400mm differentiator. If you need a weather-sealed all-in-one APS-C lens, this is your option. Otherwise, I encourage you to use the site's tools, especially the lens specifications to determine which lens is ideal for you. While the lens designers have pulled off a first and a feat in getting the awesome 18-400mm focal length range into a light, compact and affordable body, image quality has been set aside. Clear is that this is the longest focal length range available in a DSLR lens and because of this feature, this lens is extremely fun to use. Reviewing the results from this lens resulted in mostly disappointment from a critical inspection standpoint. That is not fun, but that is not what this lens is about. If web-sized final results are adequate, this lens may be ideal for you and turning up the sharpness can mask some of the IQ issues (though perhaps not the AF inconsistency issues). If having this entire focal length range immediately available makes the difference between getting the photo and getting nothing, this lens can be the ideal choice as a mediocre-quality image is much better than no image. If you despise changing lenses or simply cannot due to environmental issues, this one might work for you. If you must have the 400mm focal length in the absolute lightest lens possible, this could be the lens you are looking for. While the "perfect lens" may not exist, lens manufacturers who produce all-in-one zooms do their best to mitigate the compromises that must be made to achieve the most versatile lens possible. 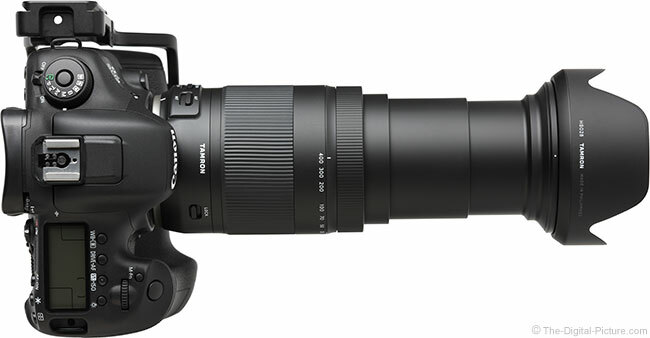 In this case, Tamron's design team has done an admirable job at finding a very reasonable balance between size, weight, specifications and price with the 18-400mm VC. The Tamron 18-400mm f/3.5-6.3 Di II VC HLD Lens will likely have some popularity among those that want the ultimate flexibility in a single lens.